The European Institute for Underwater Archaeology (or IEASM, after Institut Européen d’Archéologie Sous-Marine) is a non profit organisation under French law. Its mission is to research and explore archaeological sites of historical significance. IEASM is able to call upon outside experts in archaeology, history, conservation restoration, geophysics, geology and advanced technology as required. The Institute is involved in the restoration of the artifacts it recovers. It publishes monographs and articles about the excavations and their scientific results. It also aims to present the results of its excavations to a wider public through the publications of books, press articles and films as well as the organisation of exhibitions. IEASM developped a systematic approach to the archaeological sites. This has led to valuable discoveries adding greatly to our historical knowledge. xxxxxx made it possible for several institutions to benefit from the excavations. Since its foundation, the Institute ihas been directed by Franck Goddio who devotes himself entirely to the underwater archaeology and the dissemination of the discoveries through the publication of books and articles as well as the organisation of exhibitions. The Institute cooperates closely liaison with the authorities in the countries of which it works and under their supervision. For example, the Far Eastern Foundation for Nautical Archaeology (FEFNA), was established in the Philippines with the project of conducting archaeological excavations in Asia, editing scientific publications and ensuring that the artifacts are exhibited to the public. The Institute subscribes to the standards of the 2001 Convention on the Protection of the Underwater Cultural Heritage. 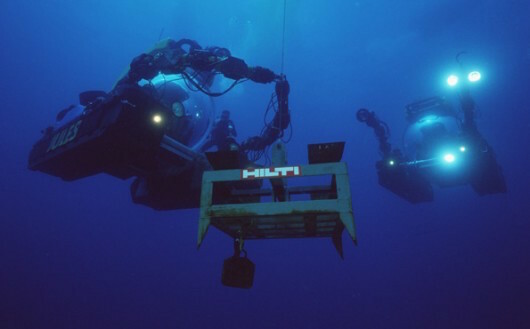 In 2003, IEASM, the Hilti Foundation and Oxford University have established the Oxford Centre for Maritime Archaeology (OCMA). OCMA is an intramural research centre at the university’s School of Archaeology. OCMA teaches maritime archaeology at an undergraduate and postgraduate level and runs conferences on the subject. Postgraduate students are able to examine the artifacts discovered by IEASM. OCMA supervises doctoral theses as well and scientific papers including those on the excavations and results of IEASM. To date, three doctorates have been awarded and three others are in progress. The monographs published in collaboration with OCMA form part of the monograph series of the School of Archaeology. All the titles are subject to an internal review process by members of the School of Archaelogy, the Oriental Institute of Egyptology and the Ashmolean Museum. Each title is also peer reviewed by relevant experts from outside institutions. Watch the Oxford University podcast here. The aim of the research project initiated in 1992 by the European Institute of Underwater Archaeology in Egypt was to map the ancient topography of the now submerged areas of the East Alexandria Port (Portus Magnus). To meet this challenge the IEASM implemented a methodology already proven in the identification and scientific excavation of several wrecks such as the galleon San Diego (1991-1994) in the waters of the Philippines. It allowed a general understanding of the site to be gained before excavation. This study is part of the geodynamic research of the natural and anthropic features and analysis of the co-evolution of the environment/society in ancient times on the western coast of the Nile Delta. The mapping of the land and the port infrastructure of the Bay of Alexandria as a whole was extended to about thirty kilometres north-east of the bay of Aboukir, giving new research perspectives. The work of physical geography, geomorphological surveys, paleo-botanical and marine biology, and the study of the circumstances and chronology of events that led to the submersion of the banks, showed the need to take into account the diversity of each site, the variable weight of sediment dynamics, the mobility of the sea level, and the mastery of the physical environment directly related to the organization of space. Applied to the Egyptian coast, especially the Alexandria area and the western edge of the Nile Delta, the methodical and systematic approach of the IEASM proved successful and brought new knowledge of the topography, the toponymy, the periods of occupation, essential to the understanding of coastal areas. The findings, based on sound knowledge extended by modern scientific methods, included information that was not directly archaeological – inventory of beds of river, colluvial and alluvial areas, coastal lakes, winds, currents, etc. – all of which developed the understanding that we have of the sites of Alexandria and Aboukir bay. The global research objectives were to understand the organization of the Portus Magnus of Alexandria and the sites discovered in Aboukir Bay (Thonis-Heracleion and Canopus East), taking into account a decade’s archaeological findings. The preliminary scientific step were geological and geophysical surveys which would then be enriched by archaeological data from the search. The study thus considered all the geomorphological/archaeological data together with information from epigraphic, iconographic, and literary sources. In addition, it could not be understood without a thorough knowledge of the historiographical accounts of the early explorers. In Alexandria, taking into account the tendency to magnify the Mediterranean metropolis, this information allowed the establishment of benchmarks in the area of research which covers 400 hectares of the present port. A known location on the coast of Caesareum, marked in the past by the two ‘Cleopatra’s Needles’ was a known ancient reference point. Similarly, the current cape Silsileh corresponds to a remnant of the ancient cape Lochias, which formed the eastern boundary of the former Portus Magnus. Finally, the presence of extensions of port infrastructure and submerged lands under the waters of the port of Alexandria was no doubt given the remains found on land and the descriptions of the Portus Magnus provided by texts. In the Bay of Aboukir, the possibility of orientating research according to points corresponding to identified ancient places was almost impossible. Instead of having clear markers near to the submerged sites, reference points were in fact large areas of terrestrial and submerged remains, with only vague outlines and distant from each other. In addition, the geomorphological configuration and the geological conditions specific to the Canopic region differed somewhat from those prevailing in Alexandria Bay and therefore raised a number of specific questions. 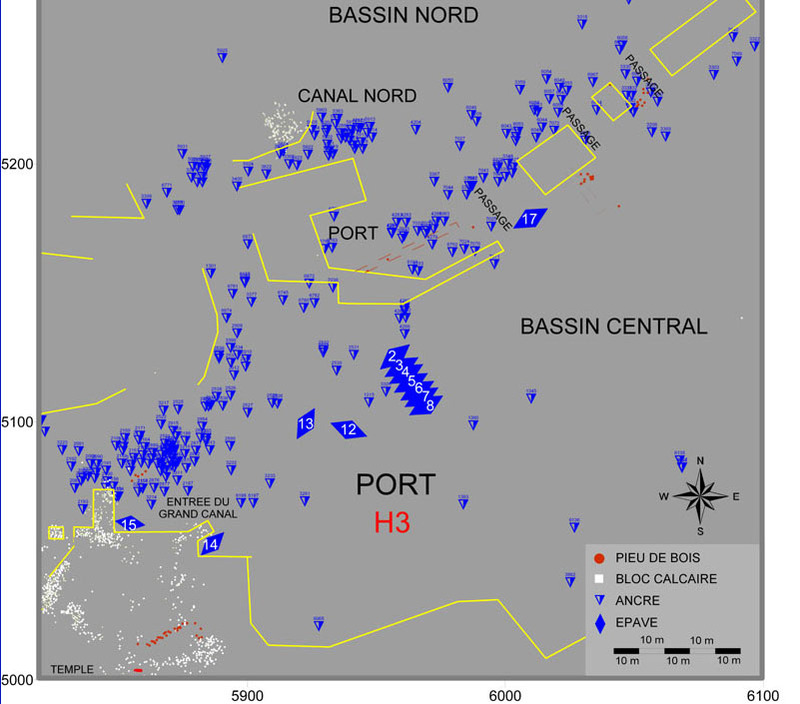 The work undertaken in 1996 in the Bay of Aboukir was therefore, before any archaeological excavation began, to determine the contours of the submerged Canopic region. This is a large triangle of land 10 km high and 10 km across the base – the position of the main archaeological sites corresponded to the cities mentioned by the ancient texts, as did the line of the bed of the old western branch of the Nile. The scientific approach to predefined surveys took into account the topographies of the areas studied. The ancient relief of the now submerged lands has been changed over the centuries by seismic (earthquakes and tidal waves), aquatic (flooding and sea-level change) and geological (subsidence) forces. But changes did not stop with immersion. Once submerged the terrain was no less subject to seismic activity, to the actions of sediments, currents and waves. 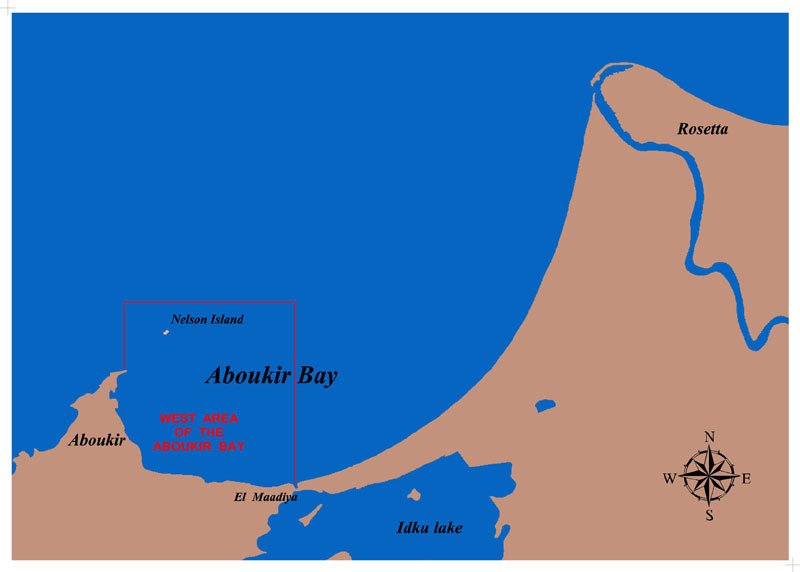 For example, the upper layer of the sea bed in the Bay of Aboukir consists mainly of sand and silt from the Nile, brought by Easterly currents. Similarly, in Alexandria, the bottom has much sedimentation, which has accumulated over the centuries in the western part of the Port. It is this silt which covers the area of the ancient Heptastadium causeway, and on which is now built an entire neighbourhood. It seemed likely that many archaeological remains in these areas were covered with sediment. While it is possible to locate artefacts and structures by precise mechanical surveys over small areas, this approach was unrealistic given the scale of the area under consideration. Only searches using the latest electronic equipment, like nuclear magnetic resonance magnetometers could achieve this. An effective way to locate archaeological remains submerged and covered with sediment was to create a highly detailed magnetic map using NMR magnetometers. Continuously measuring the value of the geomagnetic field with an accuracy of a few thousandths of gamma, they reveal any buried archaeological remains. An echo-sounder, side-scan sonar, and more recently, multi-beam sonar, provide an electronic image of the sea floor and reveal any objects projecting from the sediment. They were especially useful for the location of archaeological areas that were not completely covered. 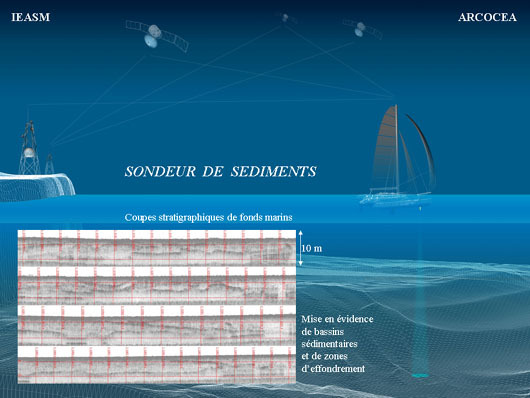 A survey conducted by sediment sonar supplied geological information about the different layers forming the sea-floor of the area. This is capable of providing information about local seismic events (revealing inclined sedimentary layers, horsts, diapirs, etc.). Research shows that the sites were struck at different times by cataclysmic geological events. They also confirm the slow land subsidence that affected this part of the south-eastern Mediterranean basin. Geological observation revealed these through the discovery of seismic after-effects in the seafloor substrate. Geological analysis also showed in some places, principally in the Bay of Aboukir, the signs of soil liquefaction. These local events can be triggered by the action of a high pressure on land of a clayey nature. The weight exerted by monuments, combined with the extra weight of an exceptional flood or a tsunami, creates compression, which then causes the expulsion of the water contained in the structure of clays. These latter suddenly lose their volume which creates sudden subsidence. An earthquake can also induce the same phenomenon. These events, occurring independently or concurrently, could cause major destruction, and explain the disappearance under the waters of a large portion of the Canopic region and the Portus Magnus of Alexandria. Regular collapse and sea level rise- recognized since antiquity- have obviously contributed significantly to the flooding in this area. It is thought that in Alexandria the sea level has risen by 1 to 1.5 meters, and the land level fallen by 5 to 6 meters during the last 2000 years. The South-Eastern coast of the Mediterranean is also subject to tectonic movements due to the subduction of the African plate beneath the Anatolian plate. Ancient texts record earthquakes and tidal waves hitting the region, in particular, the tidal wave of 365 AD that affected the coasts of the south-eastern Mediterranean, the earthquake in the middle of the eighth century, and that of 1375 which destroyed the lighthouse. The results, merely outlined here, show the effectiveness of the search method. Designed to be comprehensive, these surveys themselves provide interpretable archaeological data about the history of land use and the evolution of the landscape, even before any intrusive and destructive archaeological work begins. The exploration program is the first step towards a possible excavation, it can demonstrate the need to continue and to intensify the archaeological activity on certain areas of the sites. 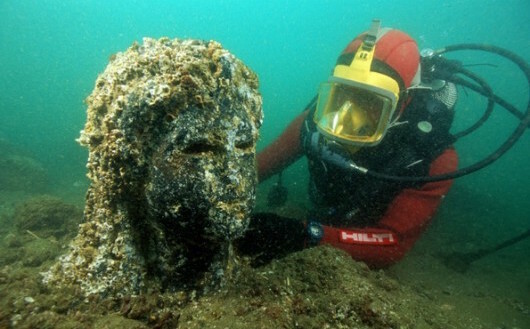 Field experiment: the example of Thonis-Heracleion (Aboukir Bay, Egypt). In the Bay of Aboukir, in the now submerged Canopic region, remarkably large magnetic disturbances were recorded by side-scan sonar 6.5 km east of the modern coast. These magnetic signatures, verified by dives, corresponded to building blocks coated with marine growth 60 to 80 cm thick. A fine magnetic grid (cross bands 10m), a detailed photo mosaic by sidescan sonar (at 50m) and bathymetry with a mesh of a meter, were undertaken over 1.5 km2 of remains. 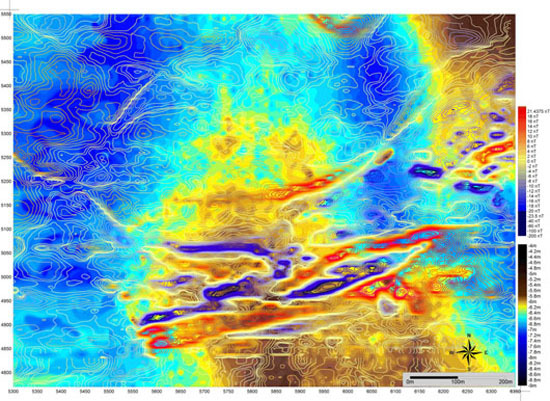 The detailed magnetic map showed a network of long anomalies oriented North-North-East to South-South-West, particularly in an area of 700 x 1500m. Magnetic scanning sonar in particular revealed the characteristic alignment of a wall. Fine bathymetric examination revealed a seafloor with ridges, offshore bars, dunes, depressions, etc. Geophysical prospecting, with geological coring, visual surveys (complicated by a visibility of not more than 30cm), and the removal of some of the surface, revealed an interpretable topography. Several former beds of Nile branches were identified. The easternmost branch was separated from the land by a still partially visible cordon of dunes. It was bordered on the west by the dunes up to its mouth. The old river reached the present coast near the port of El- Maadiya. On the west bank of the mouth the sand dunes to the north were replaced by a rock band that extends towards the island Dissouky. Thus in ancient times the coast there was rocky. A large depressed area, most likely corresponding to a slightly salted lake, and marshes (there is a significant quantity of plant material in the clay layer), extended to the west of the dunes bordering the branch of the Nile. The sector characterized by a strong magnetic gradient and large constructions is set back from the dunes, on a sort of peninsula between two depressions, corresponding to the docks to the east and a lake to the west. To the west a wide flat area of silt and clay, with a few headlands, joins the current coastline near Aboukir. In this direction, at the same latitude as Thonis-Heracleion, the ruins of important monuments from different eras, belonging to the site of Canopus East, are sited. In this part of the peninsula, surface removal, excavations, and the types of objects unearthed, permit the identification of the ruins as those of the ‘sacred area’ of the city. A temple wall more than 150m long was uncovered. The discovery of the naos (the monolithic chapel which contained the image of the principle god of the shrine) dedicated to ‘Amon Gereb’, and the indications on the stele of the Decree of Canopus, allows the city in which it was built to be identified – Heracleion – as well as the main god of the city. The site was revealed to be a vast port complex that unfolding to the North and East of the temenos dedicated to Amon Gereb, whose temples and annexes stood on a central promontory. To the south-east there was access to docks and a large outer harbour leading to the Nile by a narrow passage through the cordon of dunes which protected the whole. The topography corresponds perfectly to that established by Professor Jean Yoyotte from textual study: the same name Thonis (T-Hone) carries in it a particular historical geography: the city was installed on one of the "smaller basins (hone) of the branches of the Nile at the place where the diverticula that laterally detach form at the end of the branch of the lower Delta and empty into coastal lagoons, while the only major arms flows into the open sea". North of the ‘Central Basin’, and consequently to the South of the ‘eastern passage’ systematic searches revealed a concentration of wrecks dating from the fifth to the fourth century BC. To the North of the ‘eastern passage, the ‘North Basin’ allowed eventual access to the sea. If surveys and excavations have not yet confirmed it, they have instead established the existence of a channel to the North East which most probably connected to the Canopic branch near its mouth. Parallel to the study of the organization and chronology of the sanctuaries of the central promontory, excavations aim to study the forms of port infrastructure, the operation of waterways, docks, piers, wharves, breakwaters, etc. and their relationship with the economic and sacred structures of the city. To clarify the topography and establish chronologies, deep surveys are undertaken in areas previously defined by reconnaissance dives, surface clearance and surface geophysical surveys. They also help define the nature of the sea floor in order to identify the silt in the basin, check its limits or identify new port structures. This task is made more complicated by the sedimentary environment of the site. Indeed, a similarity in appearance and sometimes nature has often been observed at Heracleion between land formerly submerged and the floors of ports or channels. Some submerged lands are now, through the effects of collapse and landslide, at the same level or even lower than the floors of the ports they adjoined. These floors being no longer protected by the ports, suffered in the same way as the surrounding areas from the erosion caused by waves, swells and currents that have exposed their clay base. Almost all the sediment and soft ground which covered them in antiquity have been removed. The soils of the port floors, as well as those of the structures which stood above the water in antiquity, are now presented as covered flat surfaces, fairly evenly carpeted with mussels to a depth of about ten centimetres. Below them there is generally a layer of marine sand. There is also interpenetration between the ancient land and the docks. Amongst the recent discoveries which testify to the intense activity of Thonis- Heracleion, which from the eighth century BC was the border post / customs point and emporium through which goods imported by the Greeks passed, are the sixty shipwrecks uncovered in the docks and canals. They also illuminate the topography of the site. Firstly it was necessary, using geophysical instruments and surveys to provide a systematic identification of the vessels, to create a map of the ancient ships, to reveal any specific concentration which it was appropriate to investigate from an archaeological and historical perspective. Surface cleaning enabled information to be gathered on the form and types of vessel, and their construction. The wood remains were dated (C14). This data was the preliminary step in determining which wrecks would be excavated. Their discovery was at once an exceptional opportunity for the study of naval architecture, of the organization of maritime trade, and a source of data for the reconstruction of paleo-environments and the interaction between human societies and the environing plant life. In its goals and principles, underwater archaeology is no different from terrestrial archaeology. However, the aquatic environment imposes special constraints to which research techniques must be adapted. Before any archaeological excavation, the IEASM practices an original and systematic non-intrusive approach to marine sites, based on geophysical prospecting. Underwater archaeological prospection is carried out using various sensors which measure the physical characteristics of the site, and aims to highlight the anomalies likely to correspond to remains. A boat, equipped with measuring instruments and acquisition and processing computer systems, traverses the search area along parallel straight lines, called profiles, spaced at 30 to 80 meters depending on the average depth of the site and the size and nature of the remains anticipated. The boat is positioned in real time by a system of differential satellite positioning (DGPS). NMR magnetometers and side scan sonar, positioned by electric winches are towed by the vessel surface in shallow areas or submerged by hydrodynamic sinkers in deeper water. An acoustic positioning system continuously transmits the relative position of the towed sensors. The boat is also equipped with high-definition echo sounders. All recorded parameters are subject to a first real-time analysis during prospection. Daily data processing resulted in the creation of bathymetric maps (seafloor relief) and magnetometer (magnetic field) of the surveyed area, complemented by a sonar image of the seafloor (acoustic photograph). The techniques of geophysical analysis highlight discontinuities in the measured parameters, like the ambient magnetic field or the acoustic response. These discontinuities or contrasts are called anomalies. In archaeological applications, the amplitude of interesting anomalies is particularly low. They are often combined with many natural geological anomalies, which are also measured by the sensors, and which therefore require distinguishing. The effectiveness of this discrimination rests on the sensitivity of the sensors, their configuration and implementation, the processing of the data, and the correlating analysis of the results of the measurements of the different instruments. A first visual inspection and often submarine surveys are then carried out by experienced divers or instrumented robots to identify the origin of the anomaly measured. The main sensors of the prospecting system of the IEASM are Nuclear Magnetic Resonance magnetometers. These very sensitive sensors have been developed by the French Commissariat à l’Energie Atomique (CEA). Based on the double magnetic resonance of protons and electrons (Abragam-Overhauser effect), these NMR magnetometers measure the absolute value of the geomagnetic field more than a thousand times per second with a precision of a fifty-millionth of its value. The sensor is a field/frequency converter based on the principle of nuclear magnetic resonance amplified by dynamic electronic polarization. The hydrogen atoms of standard solvents have a magnetic spin proportional to their spin (magnetic movement). Exposed to the Earth’s magnetic field, they precess around the field at a frequency proportional to its module (called the Larmor frequency, from 1 kHz to 3 kHz in the Earth’s magnetic field). The electromagnetic excitation of resonance creates, by the phase coherence of spin, a macroscopic magnetic component precessing at the Larmor frequency. This component induces an AC voltage in the detection coil. The measured frequency gives the value of the magnetic field. The nuclear magnetism created is not directly detectable in the earth’s magnetic field. Dynamic electronic polarization amplifies the nuclear signal by a factor of 1000. The nuclear spins are coupled to the spins of the free electrons of a radical in solution. Two frequencies of the excitation of the electric resonance are possible: one generates a positive polarisation and the other a negative polarisation. The frequency depends on the solvent used. The careful selection of a pair of the same radical containing solvents will give at the same frequency, a factor of a positive polarisation in one solvent and a factor of negative polarization in the other. This is called the double Overhauser-Abragam effect. The probe consists of two separate flasks of hydrogenated solvents containing a free radical in solution, a excitation circuit of dynamic polarisation at high frequency and a low frequency circuit which respectively and simultaneously excite nuclear resonance and measure the signal. Thus the probe also includes two symmetrical coils placed in opposition. Earth’s magnetic field superimposes complex phenomena in time and space (geology of the crust, dynamo, solar-terrestrial interaction, the circulation of ionospheric and telluric currents, etc. ), involving magnetic and electrical properties. The Earth’s magnetic field can be schematically considered as bipolar with a value between 20000 nano-Tesla (NT) at the equator and 60,000 NT at the poles, to which are added a range of global anomalies (of the order of 10,000 NT), local anomalies with geological origins, and transient phenomena of some tens of NT every 24 hours. Magnetic anomalies caused by the archaeological remains are superimposed on these natural anomalies. The discrimination between these is based on the very high sensitivity of magnetometers and, if necessary on the measurement of the local magnetic gradient between two towed sensors simultaneously. This reduces gradient reading reduces in real-time temporal variations in the geomagnetic field and allows the rejection of most geological anomalies. This method using NMR magnetometers can detect very weak magnetic objects, even when deeply buried in sediment. In the Bay of Aboukir, prospecting the search area (110 km2) with a 10m grid requires 22,000 km to be travelled! 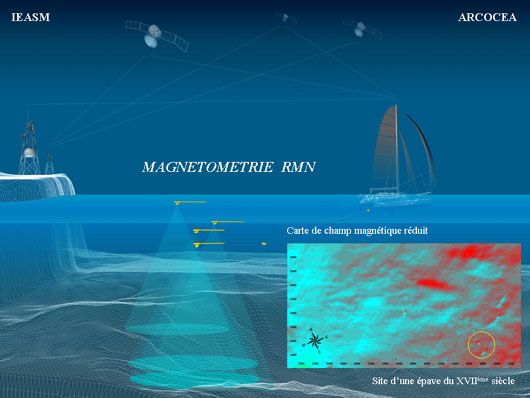 Moreover, this magnetic survey must meet specific standards: the lines followed by the magnetometer sensors, and thus the boat, should be straight and parallel, at a constant speed and orientation, without any abrupt changes in elevation. Ultimately, only exceptional weather conditions allow satisfactory results to be obtained. This sensor delivers an acoustic image of a strip of the seabed of 50 to 150 meters on each side of the ship. It reveals rocks or other prominent objects resting on the bottom and can give an indication of their size by a measurement of their projected shadows. The quality of the acoustic images of the seabed depends on the reflectivity of sediments. 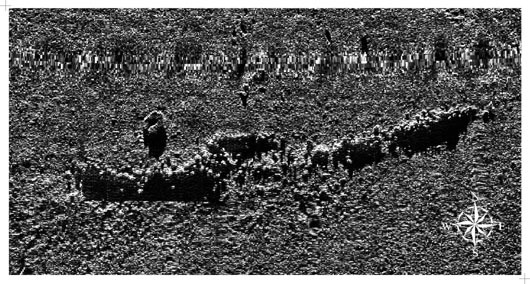 Several parameters classify the type of side-scan sonar, such as the acoustic frequency, the depth, the width of the beam (horizontal and vertical), and the duration and rate of the pulse. A transducer or "fish" is attached to a cable connected to the boat, thus enabling sound waves to be transmitted perpendicular to the direction of the boat, which are then reflected off the sea floor to be captured by the "fish". Several waves are recorded according to the degree of reflectivity, depending on the type of sediment. An irregular bottom has a lesser degree of reflectivity than a smooth sandy bottom. Obstacles and irregularities that prevent the direct reflection of the sound waves form shadows on the readings. The resulting electronic image reveals the relief of the seabed. An accurate bathymetric map of the submarine relief is obtained by the use of echosounders. These acoustic sensors deliver a continuous depth measurement along prospecting profiles. They allow the relief mapping of submerged soils to highlight ancient topography. Shallow depressions may indicate old docks while occasional buttes sometimes reveal ancient rows of building blocks. Complete bathymetric coverage was achieved over the entire area with a grid size of 20 or 40 m according to the archaeological interest of the area. The sediment sounder uses wave emission to distinguish geological changes in ground strata. It reveals their thickness and inclination. However, only geological core samples can clearly reveal their composition. They were developed by geologists to reach significant terrestrial depths, and the first few meters of the seabed, of particular interest for archaeologists, are difficult to assess using sediment sounding. Systematic coverage of the Bay of Aboukir was conducted using a grid mesh of 500m or 200m depending on the magnetometric results. GPS is a system of absolute geographic positioning over the entire surface of the earth, giving the position in latitude, longitude and altitude of a mobile receiver, using the information transmitted by a constellation of satellites. To obtain sub-metre accuracy, the level of precision necessary for archaeological research, a GPS reference station is installed on the ground to send corrections by radio in real time to a mobile receiver. The positions obtained are called differential positions (DGPS). A short range system, it is based on the regular emission of a sound signal from a transmitter, joined to the sensor to be located, received by a sensor attached to the ship. Several transmitters may be used simultaneously. The position of each transmitter is thus calculated through its distance and azimuth relative to the receiver. The vessel’s DGPS position being known, the precise geographic position of each sensor provided with an acoustic transmitter can be determined in real time. The Institute and its president Franck Goddio take actively part in the presentation of the excavations’ results and in the disclosure of the knowledge acquired by research to a wider public through the publication of books and specialized articles. Beginning in 1986, a series of scientific works have been published in collaboration with different publishing houses. Since its foundation in 2003, the Oxford Cen­ter for Maritime Archaeology (OCMA [link »]) is in charge of the scientific publications of the IEASM missions as well as the studies on the excavations’ artifacts which are carried out by PhD candidates and researchers from Oxford University and other academic institutions. Franck Goddio is the founding president of the European Institute for Underwater Archaeology (IEASM) and the Far Eastern Foundation for Nautical Archaeology (FEFNA) in the Philippines. He is also the co-founder of the Oxford Centre for Maritime Archaeology (OCMA). He was recently appointed Senior Visiting Lecturer by the School of Archaeology at Oxford University. Since 1985 Franck Goddio has initiated and coordinated research and excavations in the Philippines in cooperation with the National Museum in Manila. Notably, ten South-East Asian junks and ships (from the 11th to the 16th century), three Spanish galleons - San Diego (1600), the Nuestra Señora de la Vida (17th century), the San José (1794) - and two ships of the East India Company - the Griffin (1761) and the Royal Captain (1773) - have been subject to archaeological analysis. In Egypt, Franck Goddio directs, in collaboration with the Supreme Council for Antiquities, the explorations and underwater excavation in the Great Habour of Alexandria, where innovative working methods had to be devised for this heavily polluted and intensely sedimented area. In 1996, research resulted in a detailed cartography of the Eastern port of the city and its surroundings from the Ptolemaic and Roman periods. The current operations are aimed at studying the structure of the sites that once were erected near the palace or coastal buildings and thus putting in context the natural phenomena which finally led to the destruction of the site. In the same year, employing the same scientific methodology, Franck Goddio launched an extensive geophysical survey with the object of mapping the submerged region of ancient Canopus situated about 20 miles north-east of Alexandria. This resulted in the identification of outline of the region, the position of the old river-bed of the western arm of the Nile and the slocation and topography of the principal archaeological deposits from the Late Period in the Islamic age. The cities of Canopus East and Thonis-Heracleion, discovered in 1997 and in 2000, are also currently being excavated under the direction Franck Goddio’s direction. F. Goddio, D. Fabre (eds), Alexandria. The Topography of the Portus Magnus. Underwater archaeology in the Eastern Port of Alexandria in Egypt, Oxford Centre for Maritime Archaeology Monograph, OCMA, Oxford, en prep. F. Goddio, « Heracleion-Thonis and Alexandria, two ancient Egyptian Emporia », in D. Robinson, A. Wilson (eds. ), Maritime Archaeology and Ancient Trade in the Mediterranean, Oxford Centre for Maritime Archaeology Monograph 6, OCMA, Oxford, 2011, p. 121-37. F. Goddio, « Geophysical Survey in the Submerged Canopic Region », in D. Robinson, A. Wilson (eds. ), Alexandria and the North-Western Delta, Oxford Centre for Maritime Archaeology Monograph 5, OCMA, Oxford, 2010, p. 3-13. F. Goddio, D. Fabre, « The Development and Operation of the Portus Magnus in Alexandria : an Overview », in D. Robinson, A. Wilson (eds. ), Alexandria and the North-Western Delta, Oxford Centre for Maritime Archaeology Monograph 5, OCMA, Oxford, 2010, p. 53-74. The Institute and the Oxford Centre for Maritime Archaeology (OCMA) jointly teach classes and organise symposia and conferences on underwater archaeology. The resulting papers are published under the auspices of OCMA. Grataloup, Catherine: The ceramic evidence from Herakleion and Alexandria from the Ptolemaic to the early Roman periods. Cleopatra Sypmposium, 29-30 October 2010, Philadelphie, USA. Goddio, Franck: La prospección subacuática, clave de la protección del patrimonio sumergido, in conférence sur la protection du patrimoine maritime submergé, 13-15 April 2010, Museo Naval Madrid. Goddio, Franck. : Underwater Archaeology in the Philippines, 1985-2009, OCMA Special Lecture, 18 November 2009, Oxford. Fabre, David: The shipwrecks of Heracleion-Thonis (Egypt). Preliminary Study and Research Perspectives, in East meets West along the Maritime Silk Route. Waseda University, Tokyo, 2-3 July 2009, OCMA. Goddio, Franck: The ports and cities of the submerged Canopic region, in East meets West along the Maritime Silk Route, Waseda University, Tokyo, 2-3 July 2009, OCMA. Grataloup, Catherine: Ceramic of Herakleion: Preliminary Study of an Underwater Survey in the Western Area of the Egyptian Delta. Nile Delta WOrkshop: Egyptians and Foreigners in the Nile Delta: Trade and Interaction, 20 June 2009, British Museum, Londres. 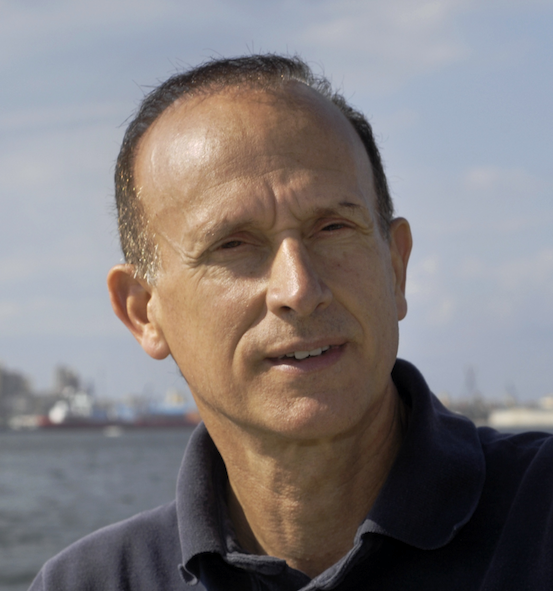 Goddio, Franck: The harbours of the Alexandrian coast : Heracleion-Thonis and Alexandria, in Maritime Archaeology and Ancient Trade in the Mediterranean. Universidad Carlos III, Madrid, 18-20 September 2008, OCMA. Fabre, David: The organisation of maritime Trade in ancient Egypt : the Example of Heraclieon-Thonis, in Maritime Archaeology and Ancient Trade in the Mediterranean. Université Carlos III, Madrid, 18-20 September 2008, OCMA. Dupoizat, Marie-France: The Ceramic of the "Investigator" Shipwreck. Symposium on the Chinese Export ceramic Trade in Southeast Asia. National Library Board, Singapore, 12-14th March 2007. in prep. Goddio, Franck: Herakleion-Thonis : A Port of Entry into Egypt. Location and Preliminary Topography of the City, in the Trade and Topography of Egypt’s North-west Delta : 8th century BC to 8th century AD, Berlin, 28-30 July 2006, OCMA. Nur, Amos: Destructive Earthquakes in Alexandria and Aboukir Bay, In Alexandria and the North-Western Delta, Berlin, 28-30 July 2006, OCMA. Goddio, Franck: The Enigma of the Cities of Heracleion and Thonis Revealed., in European Egyptologists, a gaze at the future, 19-24 September 2006, Cracaw. Robinson, Zoe: Living with Metals in Hellenistic Egypt : New Finds from Heracleion-Thonis, in the Trade and Topography of Egypt’s North-west Delta : 8th century BC to 8th century AD, Berlin, 28-30 July 2006, OCMA. Kiss, Zsolt: Le Dieu Nil hellénistique : A propos dune sculpture de Canope, in the Trade and Topography of Egypt’s North-west Delta : 8th century BC to 8th century AD, Berlin, 28-30 July 2006, OCMA. Stolz, Yvonne: Jewellery finds fom site T in Aboukir Bay, in the Trade and Topography of Egypt’s North-west Delta : 8th century BC to 8th century AD, Berlin, 28-30 July 2006, OCMA. Bomhard (von) Sophie A.: The Naos of the Decades : The discovery of the New Fragment and their Contribution to the Interpretation of the Monument, in the Trade and Topography of Egypt’s North-west Delta : 8th century BC to 8th century AD, Berlin, 28-30 July 2006, OCMA. Grataloup, Catherine, Fabre David: Heracleion : Occupation and trade evidence from the late Period to the Ptolemaic period, in the Trade and Topography of Egypt’s North-west Delta : 8th century BC to 8th century AD, Berlin, 28-30 July 2006 OCMA. Goddio, Franck: Underwater archaeology : Method and techology, March 2006, Journées du Patrimoine archéologique, National Museum of the Philippines, Manila. Goddio, Franck: Travaux récents dans la région d’Alexandrie, 16 May 2005, Centre culturel français d’Alexandrie. Goddio, Franck: Les découvertes du Prince Omar Toussoun en baie d’Aboukir in Omar Toussoun et ses découvertes à Alexandrie, 17 February 2005, Bibliotheca Alexandrina, Alexandrie. Goddio, Franck: General topography of the Portus Magnus : Interpretating the excavations (1992-2000), in Alexandria and the North-Western Delta, St Hugh’s College Oxford, 18-19 December 2004, OCMA. Stanley, Jean-Daniel. et Landau E.: Submergence of Archaeological Sites in Alexandria’s Eastern Harbour, in Alexandria and the North-Western Delta, St Hugh’s College Oxford 18-19 December 2004, OCMA. Goddio, Franck: Thonis-Heracleion : transfer of the Emporium to the Portus Magnus, 7 November 2004, Centre culturel français d’Alexandrie. Yoyotte, Jean et Goddio, Franck: Découverte d’Héraklion d’Egypte dans la baie d’Aboukir, 24 June 2004, auditorium du Louvre, Paris. Goddio, Franck: Thonis-Heracleion, antique Emporium d’Egypte : mythe et réalité, May 2004, Centre culturel français d’Alexandrie. Goddio, Franck: Archéologie sous-marine : méthodes et techniques, May 2001, La Havane. Goddio, Franck: The Topography of the Portus Magnus, 10 April 2001, The Bristish Museum, Londres. Goddio, Franck: Trésor englouti : Céramiques chinoise du XVe siècle provenant de la jonque Lena, 6 April 2001, Collection Baur, Genève. Goddio, Franck: Les dernières fouilles à Alexandrie, December 2002, Unesco, Alexandrie. Crick, Monique: Typologie des porcelaines provenant de la jonque Lena, Colloque de la SFECO, 23-24 November 2000, Musée Cernuschi, Paris. Goddio, Franck: Fouille d’une jonque de l’époque Hongzhi aux Philippines, Colloque de la SFECO, 23-24 November 2000, Musée Cernuschi, Paris. Goddio, Franck: Underwater archaeological survey of Alexandria’s Eastern Harbour, in International Workshop on Submarine Archaeology and Coastal Management, Alexandria 7-11 April 1997, University of Alexandria and UNESCO. The activities of IEASM in the field of maritime archaeology are supported by important companies. For more than fifteen years, the HILTI Foundation has been a loyal patron of all research activities of the IEASM in Egypt. The activities of the Institute are one of the central engagements of the cultural wing of the Foundation. In the past, other partners such as the Gould Foundation, EADS, Commerzbank and the ELF Foundation have participated in specific projects. The involvement of institutions like the Asso­ciation française d’Action artistique (AFAA) at the Ministry for Foreign Affairs in France or the Culture Fund of the Communidad Autonoma de Madrid and the Caja Madrid (Spain) in aspects of different projects reflects the interest of European cultural decision-makers in making heritage known to a wider public.